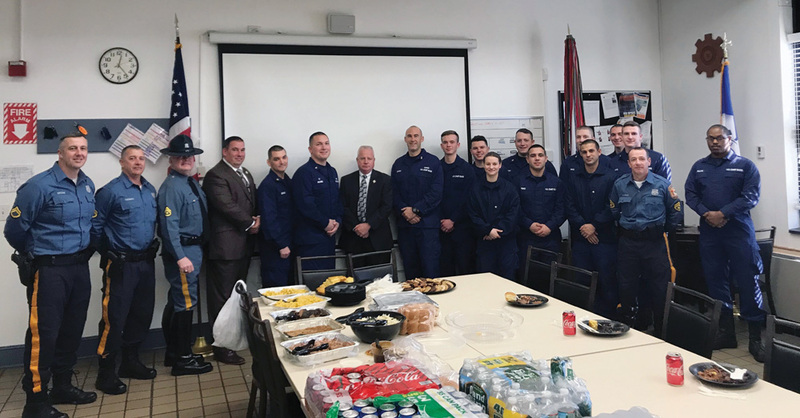 The Delaware State Troopers Association, the Delaware State Police Union and the Delaware State Police Maritime Unit took food for all the Guardsmen stationed at the Indian River station on Tuesday, Jan. 22. As the federal government shutdown enters an unprecedented second month, more than 30 staff members at the U.S. Coast Guard Station at Indian River are continuing to work, despite missing a paycheck, but they have scaled back operations, according to one staff member who asked not to be identified. The staff members are normally paid on the first and 15th days of each month but have not yet received the check due to them on Jan. 15 — the same situation as hundreds of thousands of federal employees nationwide. The staff member indicated that Coast Guard members are struggling, both financially and mentally, due to the strain of not being paid, and of not being able to fully do their jobs. “None of us are doing very well right now,” the staff member said. Coast Guard spokesperson Shannon Kearney responded to questions about the status of the Indian River station with a statement: “The Coast Guard will continue operations authorized by law that provide for national security or that protect life and property during partial government shutdowns; however, there are some impacts to our day-to-day operations. The Coast Guard stops or curtails mission activities that do not fall into those aforementioned categories. “Coast Guard uniformed personnel will continue to perform their duties during a partial government shutdown; however, with a government shutdown, they will likely not have the full support that they need in order to maintain mission readiness,” said Kearney, who is based in Portsmouth, Va. The Indian River Coast Guard Station serves an area from Cape May, N.J. to the Delaware/Maryland line. Local residents, businesses and groups have stepped up to offer their support during the shutdown. The station has received donations of food from area businesses and has received “a lot of stuff,” the staff member said, from the U.S. Coast Guard Chief Petty Officers’ Association, which assists those currently serving in the Coast Guard through fundraisers, community service, scholarships and partnering with other military groups. Coast Guard members have also received financial contributions from the American Legion. The starting salary for an active-duty enlisted member in the Coast Guard is about $20,000 per year as base pay, according to Coast Guard recruitment information. On Tuesday, Jan. 22, members of the Delaware State Police Union, the Delaware State Police Troopers Association and the Delaware State Police Maritime Unit took meals for all Guardsmen stationed at the Indian River station. The meals, from Bethany Blues in Lewes, were purchased with funding from the DSTA’s “Troopers for Troops” program. In Delaware, House Speaker Pete Schwartzkopf (D-Rehoboth Beach) introduced House Bill 2, the Delaware Federal Employees Civil Relief Act, which would protect furloughed and other employees affected by the government shutdown from action by creditors. “Regardless of your position on this shutdown, one thing is universal: Federal government employees should not suffer as a result of this impasse,” Schwartzkopf said. “These are our neighbors and our friends, many of whom still get up in the morning to head to the office, knowing they won’t be receiving a paycheck for that day’s work,” he said. House Bill 2 would allow a federal worker or employee of a federal contractor who is furloughed or required to work without pay during a shutdown to apply to a court or administrative agency for a temporary stay, postponement or suspension of any payment of rent, mortgage, tax, fine, penalty, insurance premium or other civil obligation or liability. The stay could last for the duration of the shutdown and up to 30 to 90 days after it ends. Also under House Bill 2, landlords would not be permitted to evict federal workers for nonpayment of rent. The bill also would prohibit the lapse or termination of insurance policies for health, life, disability or motor vehicles during the covered period. In addition, House Bill 3, introduced on Jan. 22 and sponsored by House Majority Leader Valerie Longhurst (D-Bear), would provide state-guaranteed, low-interest loans to federal workers to help cover mortgage payments, medical bills, food costs and other bills facing federal workers who are going without pay during the shutdown. Under the program, M&T Bank, in partnership with the West End Neighborhood House, has agreed to provide short-term loans available in all three counties, with no credit check required. There are an estimated 500 federal workers living in Delaware who have been impacted by the federal government shutdown, not including federal contractors.